Bundly is a new startup with a really interesting service. 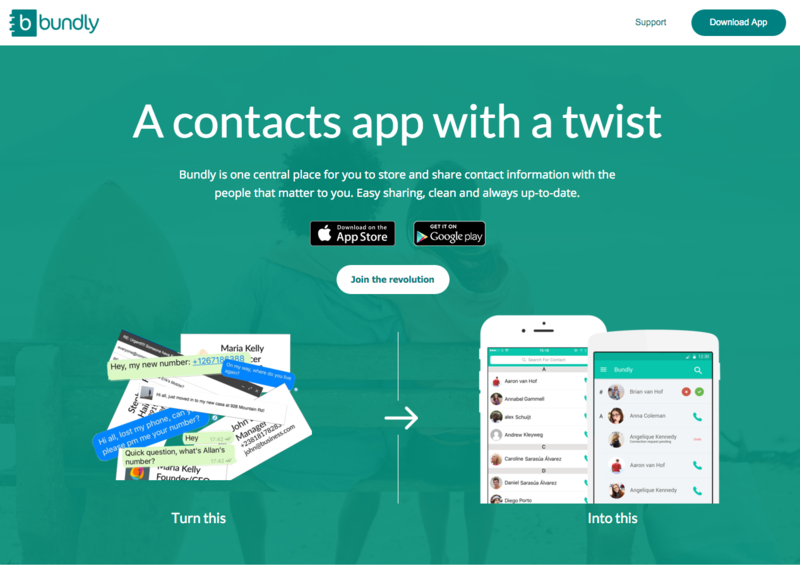 They have created a centralised address book where you can store your contact information. You connect with people that matter deciding what information will be visible to friends, co-workers, family, etc. If you change your address or your phone number you just need to update your info and everybody else will be automatically updated in their agendas. It is also free to use so what are you waiting for? Create your account, invite your friends and get in control of your personal data. Bundly is the idea of two young but experienced entrepreneurs Javier and Tim. They live in Dublin but the team of developers is located across Europe. They were looking for a tool to manage the team of developers. Their need was a tool that is easy to use and gives them a good view of how the team is doing both globally and individually. After doing some research they decided to use Happy Mood Score. Tell us something about yourselves and about Bundly? Well, we came from different backgrounds. Tim, my co-founder worked for Google in SMB Sales for the Dutch market and grew to the Product and Solution Specialist role for Europe, the Middle East and Africa, while I worked mostly on development, working recently as Lead developer for Switcher.ie. We both moved to Ireland for work, and we found the same frustration: updating our friends and family about our new situation: new phone number, new address book, new emails, company, etc. Updating them was a nightmare, so we decided to fix that and we came up a better way to exchange contact details: Bundly. We started the idea, we hire some developers remotely to help us on the development and we successfully launched our product to market last January, growing very fast since then. This situation required us to adapt our company with new tools and workflows to be able to change and improve. What kind of tool were you looking for? We were looking to keep contact with our developers. We work in a distributed team and as founders we need to know how engaged our employees are and detect as soon as possible if someone has problems or better yet someone is performing better than expected. Tracking performance and morale of our people within our company is imperative to know if we are doing things right or not. And Happy Mood Score gives us exactly that. What do you like the most about Happy Mood Score? - It is very easy to add it to our daily workflow. It’s very easy to use and manage and it doesn’t stand in the way. Our developers only need to spend a few minutes using it and we have all the information necessary to improve, which is super useful. You’ve been using HMS since a long time now what do you think about the new interface? - It is really cool. I personally love the new Ideas section, it is awesome to allow everybody to give high 5s to co-workers, and it performs really well. We are sending each other High 5s whenever we finish a task to keep the team in good spirit. - People can easily add me on Bundly if they need more reasons to use Happy Mood Score, I will be glad to answer their questions, our team loves it. You can download our app from get.bundly.io. Thank you Javier and Tim for taking the time to answer our questions and we wish you the best of luck in your project. Remember guys with Bundly you are in control of your data. And you will never lose your contacts again, even if your phone is lost. How awesome is that? This is a good example of how Happy Mood Score can help teams to be more connected and provide team managers with all the information they need to manage their team members. Give it a try.